Navigate to the Class Search and select the corresponding quarter to initiate the class search. Enter a “Value” in the Quick Search Box and click the magnifying glass to conduct a quick search. 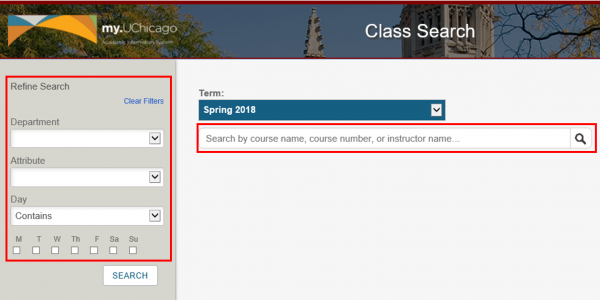 You may also use the filters on the left side of the page to narrow the search results by: Department, Instructor, Course Career, Course Attribute, or Days. *Note that the Instructor filter will appear once you have initiated a search.